Why Do Sea Snake Species Flourish In The Indian And Pacific Oceans, But Not In The Atlantic Or Caribbean? Beachgoers often find unusual things that have washed up with the tides. But many people were surprised when a venomous yellow-bellied sea snake recently was found alive on California’s Newport Beach. Sea snakes are less well-known than other marine reptiles, particularly sea turtles, even though they number more than 60 species, most of which evolved 1 to 8 million years ago. Sea snakes are found only in the Indian and Pacific oceans. For many years, herpetologists and biologists like me have pondered why there are no sea snakes in the Atlantic Ocean or the Caribbean Sea. With colleagues at the University of Florida and elsewhere, I’ve recently proposed some answers to this long-standing question. In some ways it was not surprising to see a yellow-bellied sea snake, Hydrophis platurus, wash ashore in California. This is the only species of sea snake that is “pelagic,” drifting and following the broad circulation patterns of oceanic currents. It has the broadest distribution of any squamate reptile (the group that includes lizards and snakes), ranging from the tip of South Africa across the Indo-Pacific to the Pacific coast of Central America. The snake that turned up at Newport Beach was the fourth found in California since 2015. Normally, however, this far-ranging sea snake occurs in more tropical waters where temperatures are appropriate for it. Why not the Caribbean or Atlantic? I tackled this question with Coleman Sheehy III, collections manager at the Florida Museum of Natural History; Harold Heatwole of North Carolina State University; François Brischoux of France’s National Committee for Scientific Research; and David Steadman, curator of ornithology at the Florida Museum of Natural History. In our study we considered sea snakes’ biology, evolutionary history and environmental conditions that we believe have prevented them from migrating into the Atlantic. Not all sea snakes spend their entire lives in the ocean. Some species, called sea kraits, can live on land or in water and lay their eggs on land. This limits their range because they need to stay near land to reproduce. In contrast, all entirely marine sea snakes are viviparous: They give birth to fully-formed young at sea, without laying eggs. This essential trait allowed the pelagic yellow-bellied sea snake to extend its range across the entire Indo-Pacific from an area of origin somewhere in the Coral Triangle of Southeast Asia. By the time it reached Central America’s Pacific coast however, the Isthmus of Panama had formed, fully separating the Pacific and Atlantic oceans. When the Panama Canal opened in 1914, it became possible for an occasional sea snake to enter Caribbean waters accidentally. However, this species tends to drift with currents, so it is highly unlikely that enough could pass through the canal and find one another to the east to establish a breeding population. In fact, no population of sea snakes has been established on the eastern side of the canal since its completion in 1914. Sea snakes also could enter the Atlantic Ocean by swimming from the Indian Ocean around the tip of Africa at the Cape of Good Hope. Yellow-bellied sea snakes do occur in the waters immediately east of the cape, but two major obstacles prevent them from traveling farther west. First, just west of the cape, the Benguela Current brings upwelling of very cold water to the coast of southwestern Africa. This current is 200 to 300 kilometers wide, and its water is too cold – about 55 to 64 degrees Fahrenheit at the surface – for sea snakes that might drift there to survive for long or reproduce. Second, as my research has shown, sea snakes require fresh water for drinking and will dehydrate at sea without it. They drink from “lenses” of fresh or brackish water that form temporarily on the ocean’s surface after large downpours of rain. But the climate of coastal southwest Africa is characterized by a large zone of permanent high pressure, which makes the region very dry with almost no rainfall. Sea snakes also could become established by making evolutionary transitions from terrestrial or freshwater habitats to marine habitats in the island systems of the Caribbean. We know that elapid snakes – a family of venomous snakes with short, fixed-front fangs, such as cobras – have done this in the Coral Triangle region. Indeed, most of today’s sea snakes originated and evolved into different species in this part of the globe between 2 to 16 million years ago. At that time, this region was a vast wetland complex associated with Southeast Asia and the Australasian archipelago. 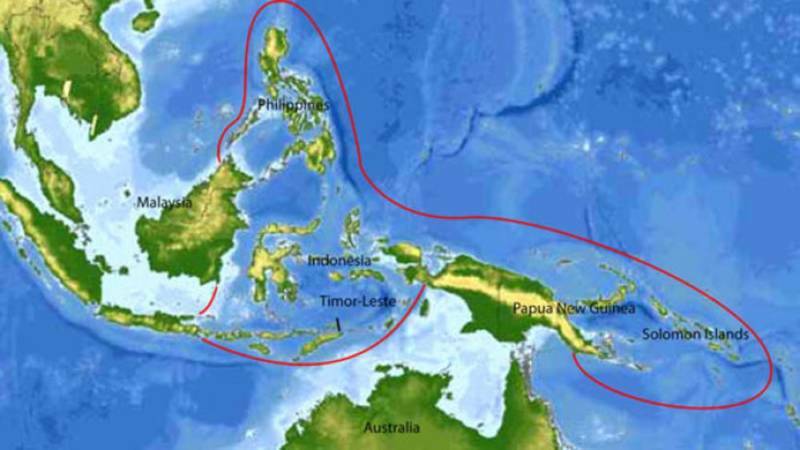 Land and sea are interlaced throughout the Coral Triangle, and have been so for several million years. This region is also characterized by high rainfall, low and variable water salinity, and relatively stable tropical warm temperatures. Throughout much of its geological past, sea levels rose and fell many times, opening and closing marine corridors and causing mangrove fringes and mud flats to form and disappear. All of these conditions are favorable for evolutionary transitions from land to sea, and stable, shallow marine habitats have persisted for the past 3 million years. Similar changes occurred in the Caribbean, but the Coral Triangle is a much larger and more complex system. Multiple ancestral lineages of snakes occur in Southeast Asia, and there are four to five times more viviparous (live-bearing), estuarine species within the Coral Triangle than occur in the Caribbean. In my view and that of my co-authors, the presence of appropriate lineages of snakes and a dynamic of ecological conditions favored speciation of sea snakes in the Coral Triangle much more so than in the Caribbean or anywhere else in the Atlantic Ocean. Indeed, the Coral Triangle, broadly defined, appears to be the only region where viviparity is characteristic of the majority of estuarine snakes. 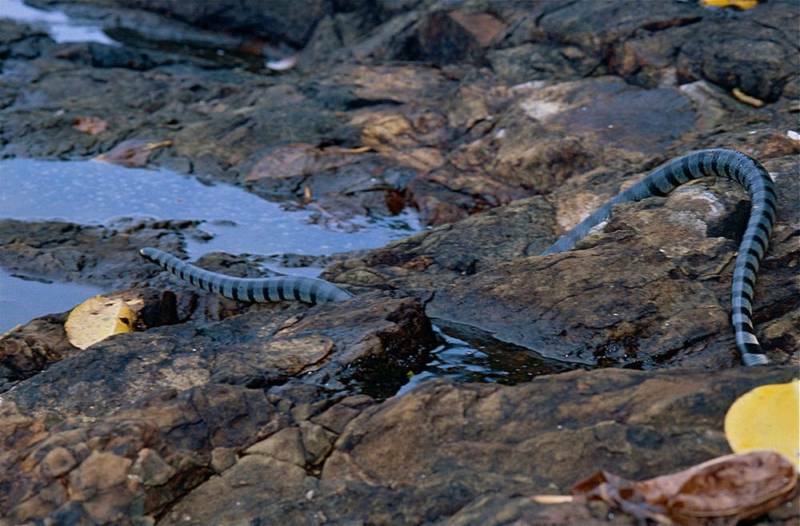 These snakes live in coastal waters contacting freshwater habitats, and they were most likely to undergo an evolutionary transition from terrestrial or freshwater to marine habitats and give rise to sea snakes. 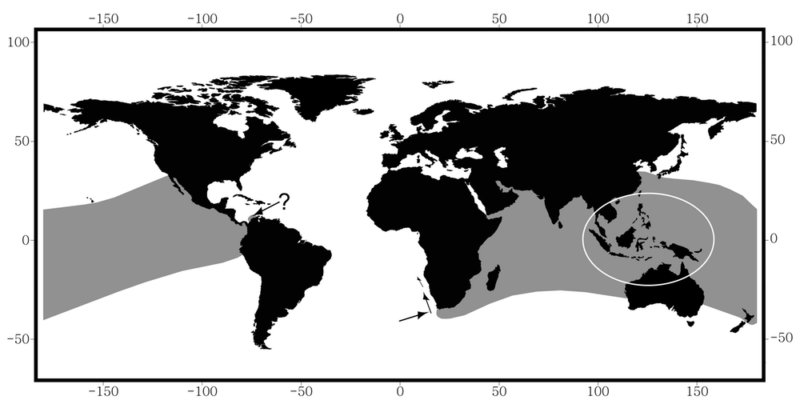 Could future oceanic and weather conditions permit sea snakes to disperse from the Indo-Pacific to the Atlantic Ocean? I believe this is quite unlikely. Thus, we do not expect any sea snake to show up on the beaches of Florida, like those occasional snakes that have drifted to land on beaches in California. There is simply no source. There are already signs that some populations and species of sea snakes are in decline or have gone extinct, owing to changes in rainfall patterns, water temperatures, environmental contamination or human exploitation. Future climatic changes might bring negative as well as positive impacts on the biogeography of sea snakes. From my own experience watching sea snakes swim with graceful undulations over coral reefs, losing them (or any other marine organism) would be tragic and could threaten the health of coral reefs where sea snakes are top predators and considered to be harbingers of ecosystem change. Harvey Lillywhite is Professor of Biology and the Director of Seahorse Key Marine Laboratory at the University of Florida. This article was originally published on The Conversation.